Sedentary seniors are at a greater risk for developing health issues such as heart disease and diabetes. Fortunately, it only takes a few minutes of exercise each day to counteract the negative side effects that accompany too much sitting or lying down. The following six activities are all simple enough for most seniors to incorporate into their daily routine, even if they haven’t been exercising regularly. Walking is one of the most effective forms of exercise most people can do, and even seniors in wheelchairs benefit from sitting upright and using their arms to control their movements. Keep in mind seniors often require assistance to stay safe while walking. Make sure your aging loved one has a companion to provide support if he or she gets weak or needs to find a place to rest. Consider hiring a professional caregiver to help your loved one get the physical activity he or she needs. In Sacramento, home care agencies can be a great boon to seniors. With the help of the caregivers at Home Care Assistance, your aging loved one can lead a happier and healthier life. We offer a revolutionary program called the Balanced Care Method, which encourages seniors to eat nutritious foods, exercise and socialize regularly, and focus on other lifestyle factors that increase life expectancy. Gardening is considered a hobby, but it also serves as a form of exercise. Help your loved one start off easy with a windowsill or bedside garden that encourages him or her to get up and move. As your loved one gains more strength, consider setting up a traditional garden using containers or an outdoor bed. Bending and walking through a garden space burns calories and keeps the joints limber. Being a family caregiver may require you to assist your loved one with gardening and other daily tasks. For some families, caring for a senior loved one can be overwhelming at times. Luckily, they can rely on professional respite care. Sacramento, CA, Home Care Assistance is a trusted name in respite and hourly care. Our caregivers are available around the clock to assist seniors with bathing, transportation, medication reminders, exercise, and much more, allowing families the time they need to focus on other important responsibilities or just take a break. Many seniors become sedentary because of a lack of motivation. If you suspect isolation has caused your loved one to slack off on exercise, consider helping him or her find a pet. Your loved one will simply think of playing with the pet as being fun, but every walk or toss of a ball is burning calories that helps with weight management. Seniors with balance issues sometimes give up on strengthening workouts since standing up too long could cause a fall. However, sitting too long every day weakens the leg muscles, which increases the likelihood of a fall-related injury. Help your loved one combat this issue by showing him or her how to do some basic chair exercises such as leg lifts and ankle rolls. Your loved one may soon feel confident enough to try these types of moves independently and eventually maintain greater stability when standing up. A hearty breakfast is one of the best ways to start the day, but your loved one can do even better than that by moving before getting out of bed. Simple stretches such as toe touches and shoulder rolls are easy to do in a seated position. By just doing a few of these stretches, your loved one can prime his or her brain and body to get ready to do more movement throughout the day. 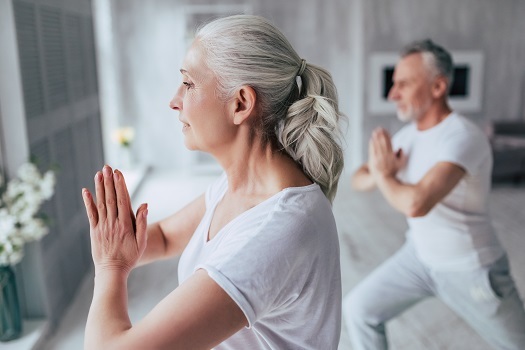 Every sedentary senior should have a goal to work toward, and learning new yoga poses is simple enough for older adults to do. In fact, yoga poses can even be modified for someone to do in bed or a wheelchair if necessary. As your loved one experiments with different poses, remind him or her of the importance of working up slowly to harder ones. You can also make yoga a social activity by enrolling your loved one in a class or asking a caregiver to do it with him or her. Sacramento elder care experts are available to provide high-quality care to seniors on an as-needed basis. From assistance with mobility and exercise to providing transportation to the doctor’s office and social events, there are a variety of ways professional caregivers can help your aging loved one continue to live independently. Call Home Care Assistance at 916.706.0169 today to talk one of our friendly Care Managers and schedule an in-home consultation.